Our Baby Boy Rocking Pony Ensemble will provide years of rocking and traveling fun for baby and some much needed items for mom! This cute little rocking pony boasts sturdy wooden construction and a natural finish. The rocker is both sturdy and safe while sized perfectly at 25 inches long by 10 inches wide and 24 inches tall. Embellished with a soft mane, bridle, fabric ears and wooden handles, this little pony will certainly become a favorite toy and travel friend! There is also an option to personalize this gift. To make it extra unique, we can embroider the baby�s name onto the plush teddy bear�s tee shirt! Please click on More Images to see the ensemble with the personalized teddy bear. In addition to the wooden pony, this set also features some adorable infant essentials and a plush teddy bear toy. 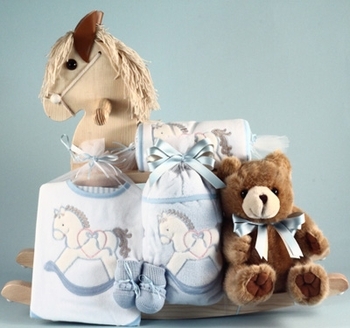 The essential layette items are all coordinated with an appliqu�d rocking horse on each and made right here in America! Unlike cheap imports, these have quality you can see and feel. All are made from with premium soft fabric of 100% cotton! Certain to stand out at the baby shower this is also a terrific way to welcome the new boy home from the hospital! Each gift set includes free shipping will arrive wrapped in clear tulle for a beautiful presentation! *The pony rocker conforms to all US Consumer Product Safety Testing and adult supervision is always recommended for children under 3.